“Snowpiercer” is a strange experience, one that may not be for everyone, but it’s certainly one of the more “general audience” friendly films to come out recently. The film is directed by South Korean director Joon-ho Bong, - making his English-language debut - who film nerds may know helmed “The Host.” Here he merges his foreign sensibilities with a mostly American/familiar cast, which you can describe to your hesitant regular folk friends and family as: Chris Evans (“You know, Captain America, except here he’s all beardy and dirty.”), Octavia Spencer (“That chick who won an Oscar for playing that sassy maid in “The Help.”), Jamie Bell (“He’s British. He was Billy Elliot as a kid. No? He was in Peter Jackson’s King Kong remake. No? Oh nevermind!”), and Tilda Swinton (“That lady who looks like an alien who’s in all those movies you probably haven’t seen.”) There are other familiar faces as well, but I digress. The point is that this fusion of familiar faces and a whiff of foreign strangeness that works wonders for the film, even if you’re not quite a knowledgeable film geek. The film quickly establishes the futuristic setting and we’re first introduced to the tail end of the train. Here Curtis (Evans) and his older friend Gilliam (John Hurt) are planning a rebellion. They’re dirty and living in squalor. Armed guards make sure everyone’s in order. They’re fed these gelatinous, black chunks called “protein blocks.” Some people have missing limbs. Someone from the front of the train keeps taking the young children. No one has ever been to the front, though people have tried. Curtis plans a rebellion, with plenty of followers in tow. He’s able to release a Korean prisoner Namgoong (Kang-ho Song), who is the one who designed the security doors that connect each train car; and his daughter Yona (Ah-sung Ko). Will I tell you how far they get? Or what or who they come across? No way. No more details are necessary. Of course, the best part of the film hasn’t really been mentioned and that is Ms. Tilda Swinton. The chameleon-like actress, in full gaudy makeup, plays some kind of leader of the upper class named Mason. She shows up in the bowels of the train to make sure the filthy tailies “know their place.” She accomplishes something so amazing here: She’s both authoritative and scary and yet she adds the most amount of necessary comic relief as well. In other words: she’s the scene stealer. It’s Bong’s fascinating strangeness that really sets the film apart from other post-apocalyptic-totalitarian-dystopian society-sci-fi-fables about the haves and the have nots. There’s a nice balance of moody atmosphere with cartoonish silliness, and makes the most of a limited setting. He presents each car of the train with its own unique personality; especially that “school car.” Production designer Ondrej Nekvasil truly creates a fascinating indoor world; it’s a true accomplishment. There are so many fascinating details here, like a green drug substance called Kronol that is later used in a more significant way. And Bong and Kelly “Before the Devil Knows You’re Dead” Masterson’s script is taught with suspenseful action and fight scenes, making the rebellion more and more intense as each train car is passed. Even if the train is only so long, you’re constantly wondering where they’re going to end up next. And to top it all off, for a film with a smaller budget, it has some pretty amazing special effects that certainly rival most of the film’s big budget competition. 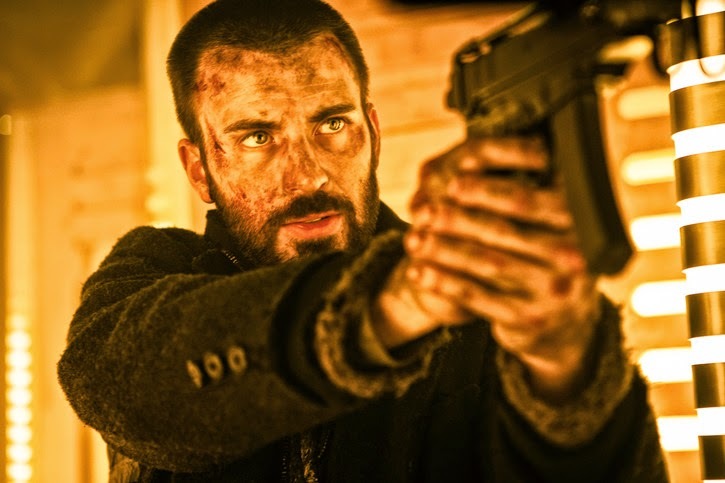 Theatrical Trailer for Snowpiercer on TrailerAddict.